It’s more than a little frustrating when you have to go the extra mile to gain access to a building or facility. How many times have we seen people getting out of their vehicles to press a button on an intercom or scan a card at a reader to get through a gate? How many people stretch and jump to get their card close enough to a reader (because they are too lazy to take it out of their pocket) to allow them through an office door? Access readers, be they card or some kind of tag, are hampered by requiring the device and the card to be very close to each other, from as much as 10 cm away to touching before they work. This may be an inconvenience, but it is also more secure and power friendly. The good news is that in certain scenarios, the option for longer range access technologies to verify someone’s access credentials is readily available. The obvious location for these long-range readers is in environments where vehicles need fast, yet secure access through booms and gates. A tag in the cab can connect over a few metres to a reader and verify the vehicle, driver or both, allowing for streamlined entry and exit. For added security, these readers can be combined with licence plate readers. ZKTeco’s Hendrik Combrinck says the market for long-range access control solutions has grown significantly in the last two years because of advances in the licence plate recognition and long-range wireless technologies. These solutions make it more convenient and faster to recognise a vehicle and give it access to a certain area. • A more controlled parking environment with less human errors, e.g. guards sleeping at night and not opening the gate on time. • Better traffic flow during office peak hours. • Restricting vehicles from entering or accessing unauthorised areas. • Vehicle counting and parking space sharing. • No more putting your hand out in the rain to tag. All is atomised by the RF antenna. Drayton continues that the products in this market operate in a similar manner to normal proximity readers, communicating the token details over networks with a Wiegand protocol. This makes them quite simple to integrate into an existing or new system where the technology works with Wiegand readers. Basically, is like using E-Tolls, says Mosadi. The tag will be on the left or right side of the vehicle’s windshield, depending on which side the RF antenna is mounted. The access control system will then ascertain which vehicle is approaching and check with a local or remote database to see if it is allowed to enter. Most of the time, these technologies are just used to ensure the vehicle can access a certain area, however, Combrinck says that he has recently started seeing end users asking for dual verification for both the vehicle and the driver. 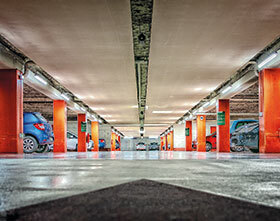 Geovision’s long-range RFID solutions can operate at a distance of between 2 and 10 metres. Mosadi says they are ideal for parking lots, gated communities and employee parking. Drayton says Paxton’s solutions centre on its Net2 product range, using RFID long-range readers and active tokens as it is the most cost effective and secure way of deploying the technology in the small to mid-market.